By keeping close track of exactly how much alcohol you consume in a given period of time, is it possible to ride that fine line between mild intoxication — or slightly buzzed, if you prefer — and all out sloppy drunkenness? For those who haven’t seen it yet, here’s a quick recap. Ahead of sidekick Watson’s wedding day, Sherlock Holmes takes him out for a stag party (that’s a bachelor party for us Yanks). Prior to stepping out for the evening, he asks pathology lab assistant Molly Hooper to calculate both his and Watson’s ideal alcohol intake to, as he put it, “remain in the sweet spot,” adding that “light headed is good." 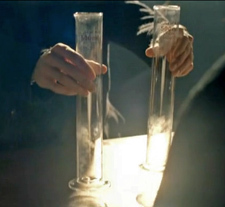 From there Holmes and Watson begin hitting bars, drinking only a prescribed 437 milliliters of beer at a time from graduated cylinders. To further avoid inebriation, they factor in things like the time between drinks, and the number of trips to the loo. Without giving away too much, this effort to avoid getting stinking drunk is ultimately foiled. You’ll have to watch it to find out why. But in theory, carefully measured beer consumption, as Holmes envisioned, could conceivably keep you relatively sober in a marathon session, like a bachelor party. However, our informal polling of medical and scientific professionals has determined that it’s way more complicated than what was depicted in that Sherlock episode. First off, it would require multiple experiments on each individual drinking, and meticulously accurate measurements over time to gather enough useful data that could be compared to known metabolic standards to get a close approximation of a person’s ability to metabolize alcohol. And even then, a straight measure of alcohol intake on it’s own just won’t produce reliable information. There are countless other variables — everything from height and weight to how much and how long ago food was consumed — that would have to be taken into consideration. Nonetheless, we still think drinking beer out of graduated cylinders looks pretty cool, and would love to see the trend take off.